Asian Americans/Pacific Islanders in Philanthropy (AAPIP) works to advance philanthropy and Asian American/Pacific Islander communities. In 2011, AAPIP launched its five-year Giving Circle Campaign to build a national movement linking local giving circles across the country to promote individual philanthropy, volunteerism and civic engagement. 2013 National Giving Circle Convening; Over 75 Giving Circle leaders gathered in Chicago in 2013 to celebrate the 10 year Anniversary of Asian Giving Circle, the oldest AAPI circle in the nation. Tell us a about AAPIP’s Giving Circle Campaign. The Giving Circle Campaign seeks to increase investments by individuals and philanthropic institutions to strengthen and empower the AAPIP community. The AAPIP network includes 37 circles, involving more than 1,200 donors in 13 regions who have given over $1.7 million to 310 AAPI organizations. How do you do your funding? Please describe your approach and process, explaining how it is different from conventional philanthropy. AAPIP’s Giving Circles are changing organizational practices in the field of philanthropy by engaging members of the communities we serve from all economic backgrounds to be involved in giving and decision making, rather than just an elite few. Friends, co-workers and family members pool their funds together to create a larger impact while exploring pressing issues in the community and collectively learning about organizations that do vital work, but do not necessarily receive funding from organized philanthropy. AAPIP emphasizes that the selection process for non-profits should be accessible and take into account that many AAPI organizations may not have full-time development staff. For example, the Circle of Change in Los Angeles requests video proposals, where non-profits are asked to make a short video on a smartphone telling the circle about their needs and potential impact. The Circle of Change then holds a screening party with their Giving Circle members to learn about the organizations. For years, AAPIs have been rendered largely invisible within philanthropy – both within organized philanthropy, and in recognition of AAPI communities’ individual or community-based philanthropic conventions. In 1992, AAPIP published Invisible and In Need, which found, among other things, that investment in AAPI communities from 1984 to 1990 amounted to no more than 0.2 percent of all philanthropic giving by foundations. Fifteen years later, AAPIP followed that seminal report with “Growing Opportunities: Will Funding Follow the Rise in Foundation Assets and Growth of AAPI Populations?” revisiting the same core analysis, and found that, while the AAPI population had doubled between 1990 and 2004, foundation funding to AAPI communities from 1990 to 2002 amounted to no more than 0.4 percent of all foundation funding. More recent data suggests little improvement. Lack of investment in AAPI communities remains an enduring challenge to philanthropy. Our National Giving Circle Campaign is built off the foundation of the many Giving Circles that came before us and from the numerous Asian cultures that have a long history of pooling their money for big expenses like weddings, starting a small business, home ownership and funerals. Communities pool their resources, identify priorities and reinvest in their own communities and their future. In the process they expand their pool of economic assets, build their social capital and demonstrate an enhanced and increased capacity to develop tools that meet community needs. Giving Circles are culturally rooted. It’s a huei in Chinese, tong-tine in Cambodian, hui in Vietnamese and geh in Korean. Any way you name it, it’s a Giving Circle, where everyday people come together to pool money and then use it to empower others. Have you ever been met with resistance or criticism when using Giving Circles? What specifically were the concerns, and how did you respond? The most common criticism we hear about Giving Circles is a question around their longevity because they are volunteer driven. AAPIP has seen Giving Circles from 10 years old to one year old and the greatest indicator of their longevity is how they set up their leadership structure from the beginning. The more collective leadership is emphasized early on, the more likely the group will sustain themselves. No matter how long the Circle lasts, we believe the philanthropic skills learned through this process are skills and values participants will hold on to. We remind ourselves that we are not trying to replace foundations or create institutions, but rather are trying to supplement the support to our community.Naysayers also think that by donating to a Giving Circle, people will give less to organizations they once funded. This actually tends to be the opposite. As individuals get involved in a Circle, they become more aware of community needs and issues. Finding foundations to serve as fiscal hosts has been an ongoing challenge. At one point AAPIP fiscally hosted all of our Giving Circles, but we soon realized that it would make much more sense to partner with a local foundation in the Giving Circle’s community. First, there is a local focus. Second, Giving Circles can learn from foundations and lastly, Foundations can learn about donors and pressing needs in the AAPI community. As we have approached foundations to fiscally host, we have come across high minimum amounts to open a fund or a lack of interest in dealing with multiple donors rather than just one donor of a donor-advised fund. On the other hand, some foundations have actually embraced Giving Circles and see an opportunity to get to know the AAPI community. The leadership development that occurs through AAPIP’s Giving Circles is having an impact at the community level by changing prevailing notions of who can be a philanthropist. For example, the Devata Giving Circle is a vehicle to empower and engage Cambodian women in philanthropy. Through its support for leadership development in the Cambodian community, it is not only empowering donors but also young Cambodian Americans. The Devata Giving Circle supports Banteay Srei in Oakland, CA, a youth development organization for young Southeast Asian women who are at risk of or engaged in prostitution. For the young women served by this organization, seeing donors who look like them sets a strong example, and inspires them with the idea that one day they themselves could be involved in giving. What’s the best piece of advice you’d give to a funder curious about doing something similar? There is an interest and willingness for AAPIs to give, get involved and have a voice in philanthropy! 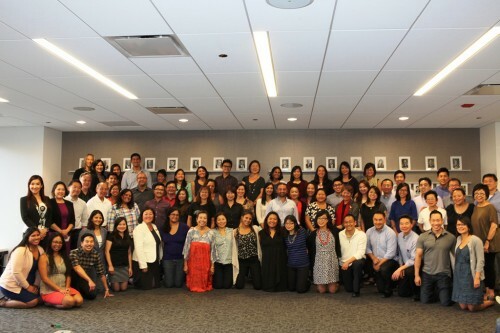 With 37 Giving Circles in the network and over 1,200 individuals across the nation, AAPIP has witnessed firsthand the potential that our community has to contribute to all levels of philanthropy and participate in our democratic society. Why do Giving Circles matter to you? Giving Circles matter to us because we believe that anyone can be a philanthropist. It is about reclaiming that word and realizing that you don’t have to be a millionaire or a billionaire to be a philanthropist. The empowerment that comes with giving can be transformational for individuals and communities. I recently told a foundation staff person that they shouldn’t judge a book by its cover. Age is often not an indicator of wealth anymore. We have a few millionaires in our Giving Circle network but they probably don’t fit the image many typically think of. The Giving Circle Movement has really helped show the breadth of the AAPI community and has given us hope that collectively we can all make a great impact.